The Canadian Baseball Hall of Fame and Museum is pleased to announce a special display of rare baseball artifacts during the Toronto Blue Jays vs Oakland A’s games on August 9, 10, 11 at the Rogers Center in Toronto, Ontario. Learn more about our exciting future developments at the Hall, including expanded ball fields and a new museum. Included in the collection set for display during the game are some incredible artifacts from some of baseball’s biggest historical moments in Canada including the actual home plate used during the 1993 World Series clinching game between the Toronto Blue Jays and Philadelphia Phillies at SkyDome and signed by Joe Carter, the series hero for the Jays. 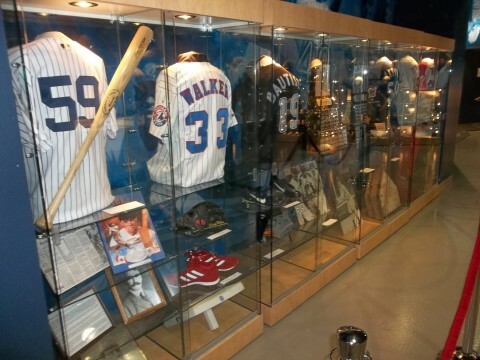 Plus Paul Molitor’s World Series MVP trophy, the 1992 and 1993 Blue Jays World Series rings, the glove Tony Fernandez used during the World Series and a Babe Ruth autographed baseball. Come find our display in the Jays store at Rogers Centre near gate 5. If you can’t make it to the game on the weekend, but would still like to learn more about the Hall of Fame or to donate to the Hall of Fame then go towww.baseballhalloffame.ca and click on the link on the front page.